For the last few years, my family has gotten together around Hallowe'en to throw a themed dressup bash that radiates with Nostalgia. This year, we celebrated in classic Nintendo style. Because I'm not big on sharing pictures of people, you miss out on a whole lotta fun costumes. Most creative and outside-the-box definitely went to my sister V---she showed up as a piranha plant, complete with her own little pipe to perch in. Brilliant! The festivities occurred over lunch, so a filling assortment of goodies was a must. 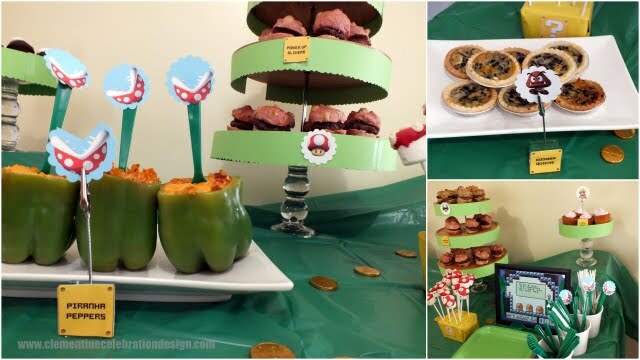 Stuffed bell peppers, quiche, and sliders were included and suited to theme. 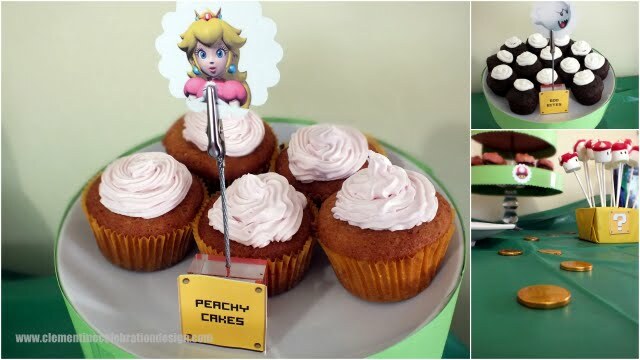 There were also two flavours of cupcakes and marshmallow pops. The table design was highliy influenced by Super Mario Bros 3, including the graphics throughout. The mister made Boo balloons and spread them out over the house. How cute is this lil' man coming to everyone's rescue against the mean ol' ghosts? 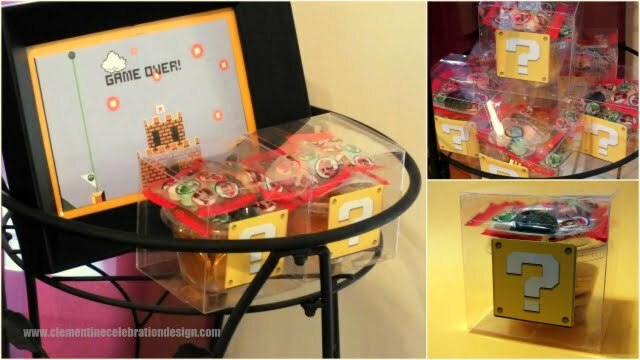 Guests were rewarded at "Game Over" time with a question mark block filled with coins and candies. The boxes are from Think Garnish and were a dream to adapt to this theme! To make things even cuter, I had to share a pic of these kissin' cousins (baby-Mario and the de-costumed duck hunt hound!) enjoying the lunch spread. As the kiddies grow up, we'll wean ourselves off of the nostalgic parties we wish we'd had in our own youth. But for now, it's pretty awesome that we get to force them into it without them being old enough to resent us for it. There's only a window of so many years before they do!! Have you thrown any nostalgic parties lately? Comment and let me know!